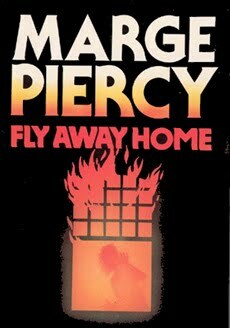 Fly Away Home is the third Marge Piercy book that I have read, and I must say I have enjoyed them all. (The other two are Three Women and The Third Child.) They have all been about women in transition. A little divorce, some intergenerational conflict, career highs and lows. And all of them definitely fall into the category of easy reads. The kind of novels that are interesting and smart, and bring up some deep issues, but are totally fun to read. Luckily this was the book I had started when John was a little under the weather while we were traveling in Provence. For hours I plopped myself on the couch in our hotel room and read while John slept. Written in the early 1980s, the book is modern but depicts a period that seems refreshingly simpler than our current fractious times. Don’t get me wrong, I know that Ronald Reagan was busy oversimplifying or outright ignoring complex issues of huge significance. And he was sowing the seeds of an overly politicized Christian right that found its very un-Christ-like apotheosis in George W. Bush and his hypocritical, anti-intellectual minions. But the latter hadn’t happened yet and thinking about nuclear winter seems somewhat quaint compared to the wild cards of global terrorism and global warming. But I digress…the protagonist in Fly Away Home is Daria Walker, a successful cookbook author, mother, and wife. That is until it becomes clear that her selfish, immature, husband is having an affair and wants a divorce. Daria’s world starts to fall apart, but like all good books of this genre, she slowly starts to pick up the pieces, and everything turns out groovy in the end. Piercy is a little heavy-handed in portraying the husband as a total piece of excrement, but it is actually kind of fun hating him and relishing in his ultimate downfall. But this book is about more than just their relationship. It also is a bit of a thriller in the sense that even though you know things are going to turn out alright, there are so many twists and turns that it kept me on hooks wondering what would happen next. The mystery hinges a lot the husband’s business dealings and how they become intertwined in the unravelling of the marriage. And for someone like me who has trained in urban planning, it also included a really interesting look at gentrification and community organizing in urban Boston. You don’t have to care about those issues, however, to enjoy this book–they are pretty seamlessly written into the narrative. And on top of everything, Daria is a food writer with plenty of foodie stuff sprinkled into the story as well. Her references to Julia Child foreshadow the current craze for all things Julia. I look forward to reading more of Piercy’s bibliography. After three successful reads, I don’t think I will be disappointed.